Photo courtesy GCAC Paul Charles gets ready to take his new puppy, Yankee, home March 21 after waiting outside Greene County Animal Care & Control for 16 hours in the rain. XENIA — A county worker waited nearly 16 hours in the rain outside Greene County Animal Care & Control (GCAC) March 21 for a German shepherd puppy. Paul Charles, who works for County Services, first met the pup on a morning maintenance run at the shelter. Xenia police officers had found the puppy in the median on West Main Street and posted a photo of him on Facebook. More than 1,000 people shared the post. When it was time for the puppy to go up for adoption, Charles found out it was on a first-come, first-served basis. “I kept tellin’ them at Animal Control that he was my dog so you might as well give him to me, but they said we had to do it by the rules,” Charles said, laughing. Charles said people started driving by around 7 a.m., asking if he was waiting for the pup. Others started lining up behind him. The doors opened at 9 a.m. The 11-week-old pup, with a brand new name —“Yankee” — was just as ready to go home with his friend. “On the ride home he was so excited. He rode in my lap, kissing me all over my face, giving me puppy breath,” Charles said. Charles took two days off work to stay home with Yankee. “When I got home at 4:00 on Monday he cried for 20 minutes while he was kissing me,” he said. Yankee reportedly has been adjusting well to his new life in Kettering with Charles, his wife Meredith, and their bullmastiff mix named Charlie. Fittingly, Senate Bill 86 named “shelter pets” the official state pet of Ohio last week. More adoptable cats and dogs — big, small, purebreds and mixes, according to Holmes-Taylor — are available at GCAC, open 9 a.m. to 6:30 p.m. Monday-Friday and 12-4 p.m. Saturday-Sunday at 641 Dayton-Xenia Road, Xenia. Pets available for adoption are listed on their website at bit.ly/2JUxEau and featured weekly in the Gazette and Herald. 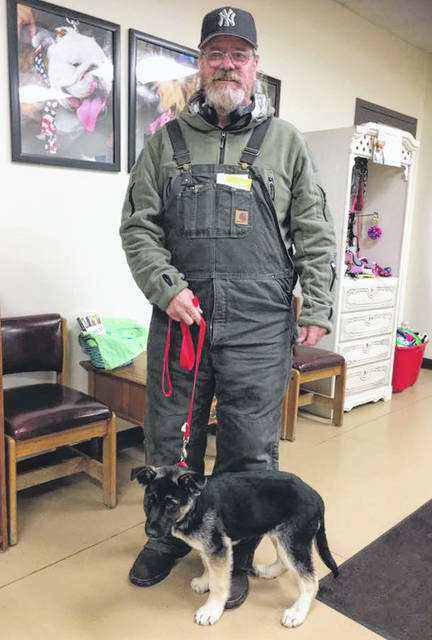 https://www.fairborndailyherald.com/wp-content/uploads/sites/50/2019/03/web1_PaulCharles-2.jpgPhoto courtesy GCAC Paul Charles gets ready to take his new puppy, Yankee, home March 21 after waiting outside Greene County Animal Care & Control for 16 hours in the rain.